I’m baking a lot of bread these days. Holding the ImaginariYUM to its name and experimenting several days a week — with different kinds and percentages of flours, with hydration levels, with folding techniques and bulk fermentation times. Even the not-so-great loaves are a thrill — the deductions of what went wrong, why perhaps this baking temperature isn’t great for that particular formula in this particular oven. It makes me remember that despite giving up in chemistry in high school, I’m a scientist at heart. I want to know how things work, why things are they way they are. Making naturally leavened bread is the perfect juxtaposition of science and my other love, art. Know thy formulas, deduce, experiment, test again, but feel it and express it with your heart and soul. 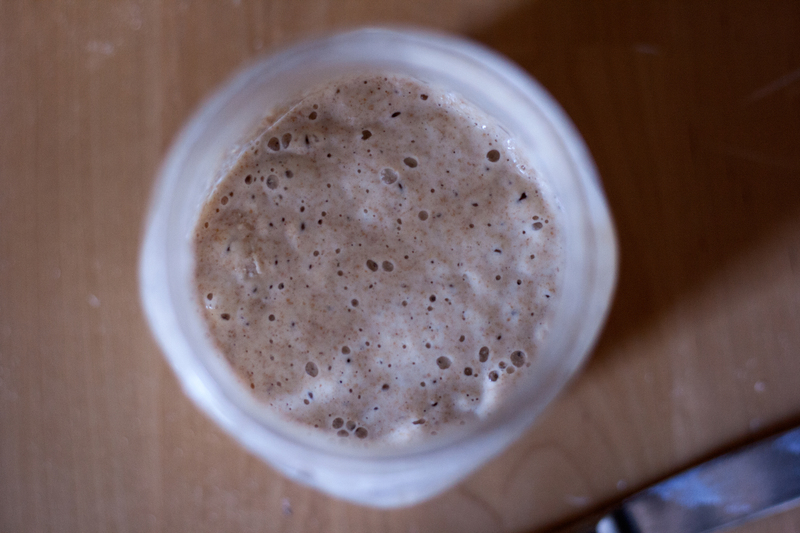 All this experimentation means, though, that I have a ton of discarded starter sitting in my fridge. To build naturally leavened bread, you see, instead of using commercial yeast, you ferment flour with some water, air, and time. This reaction brings the wild yeast that’s naturally present in the flour and the good bacteria lactobacillius that’s naturally present in our environment to life, giving rise and flavor to your breads. Being living organisms, you can’t just take a teasponful out of the fridge like you can with commercial yeast and expect it will all be well — you need to nurture them, to feed them, with more flour and water and time. And to do that, you discard some of it, then refresh the rest, keeping the starter happy and healthy and in balance. Thankfully, though, you don’t need to actually discard starter down the drain when you feed it — there are so many delicious things you can make with it, though it’s still often hard to keep up if you’re refreshing every day. 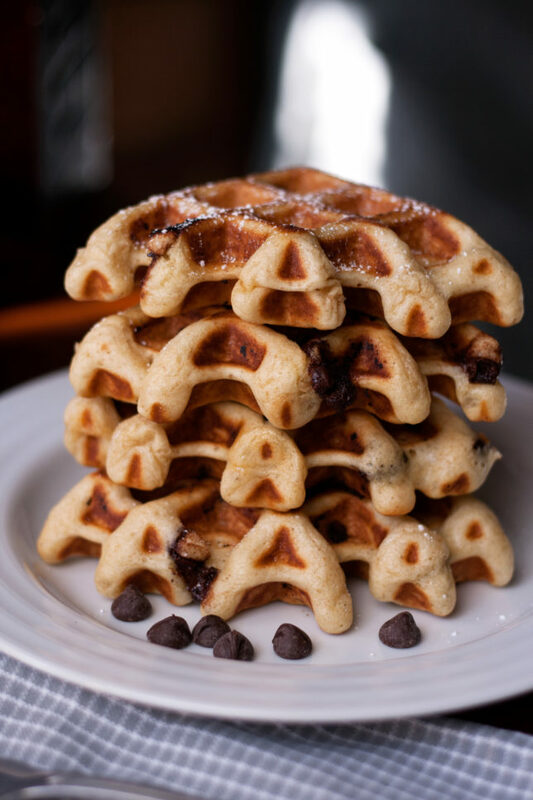 My favorite, though, is sourdough waffles. 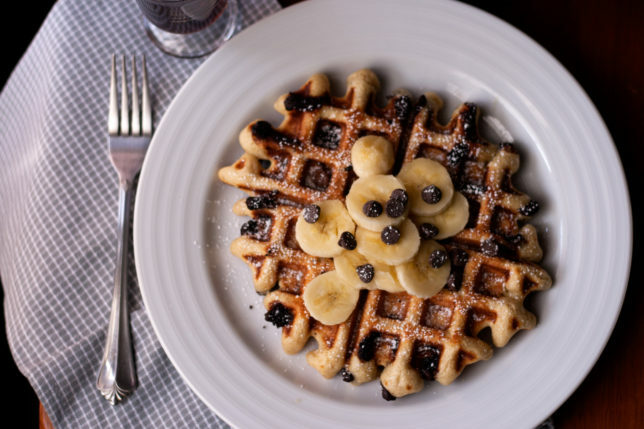 Plain sourdough waffles are straight and to the point, with a hint of sweet and a hint of tang that’s perfectly complemented by a nice dousing of pure maple syrup. But sometimes we need to go further than that. 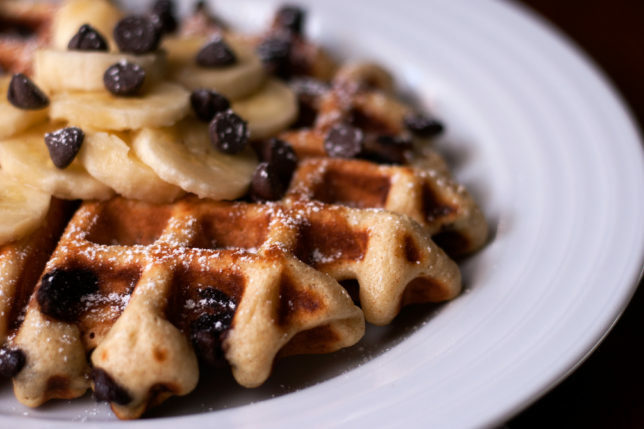 Sometimes we need chocolate chip sourdough waffles. I love these because they’re not only resourceful, but they’re delicious, too. They’re thick but light, delicately chewy on the inside and crisp on the outside. The melty little dabs of chocolate chips peppered throughout are a highlight — sweet if you go semi-sweet, rich if you go bittersweet. Either way, you can’t really go wrong. 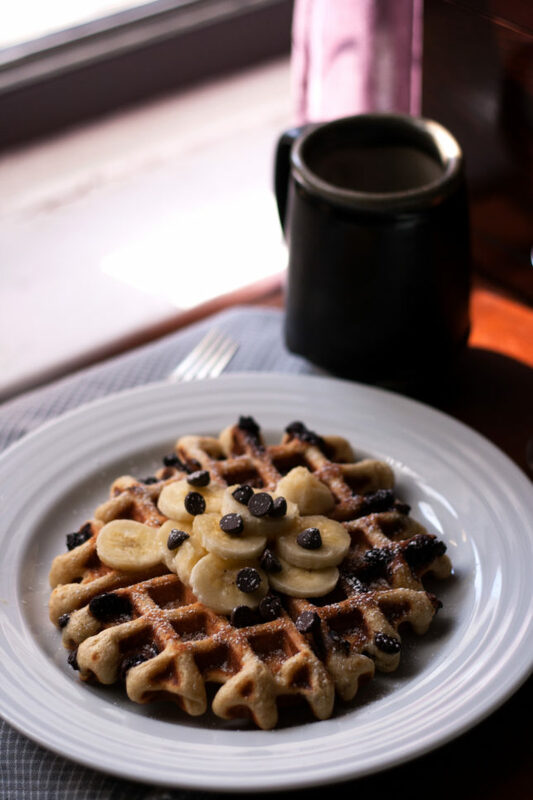 I love these topped with sliced bananas, a flurry of powdered sugar, and a gentle pour of maple syrup. If you don’t have a starter, don’t panic — you can still make these. King Arthur Flour has a great recipe for a “jump-starter,” which I’ve included below. Or, if you’re nearby, hit me up. I’ve got plenty to share. Happy breakfast, y’all. I used my Belgian waffle maker for these. If you choose to make a thinner, non-Belgian-style waffle, you may want to thin the batter out with a little more milk. Combine, cover, and set at room temperature overnight. In a medium bowl, whisk together the starter and milk. Add the butter and whisk again. Separate the eggs and add in the egg yolks, whisking until incorporated. Whip the whites to stiff peaks with a hand mixer in a separate bowl. Pour the starter mixture into the flour mixture and fold to combine — do not over-mix. Add the whipped egg whites and fold even more gently so as not to deflate, until just combined. Pour in the chocolate chips and fold those in, too. Cook the waffles according to your waffle-maker’s instructions. 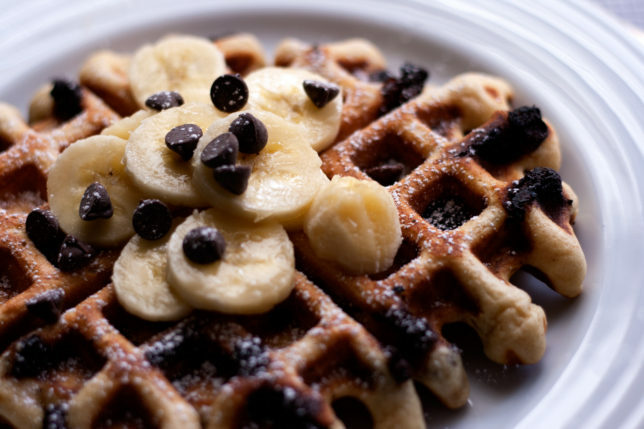 Serve with bananas, powdered sugar, and maple syrup on the side.